"Journey aka OR7" by Gerard Malanga was offered by Poets.org's Poem-A-Day on March 10, 2014. A link to the poem, including the poet's notes as well as a link to another poem by the same poet, may be found here: http://www.poets.org/viewmedia.php/prmMID/23907?utm_source=PAD%3A+Journey+aka+OR7+by+Gerard+Malanga&utm_campaign=poemaday_031014&utm_medium=email. Gerard Malanga (b. 1943) is a photographer and filmmaker as well as the author of numerous books of poetry. He worked closely with Andy Warhol in the 1960s, and was dubbed "Warhol's most important associate" by The New York Times. Additional biographical information may be found here: http://www.gerardmalanga.com/about_frame.htm. The poet reveals in his notes that his poem was inspired by a lone gray wolf known to biologists as OR7 aka Journey (pictured). 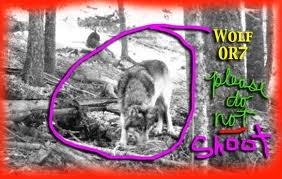 The wolf became something of a legend as it prowled the Pacific Northwest in 2012 in search of a mate. The ragged free verse of the poem consists of seven queries, all ending in question marks--an unusual choice of punctuation to use throughout a poem. Perhaps the poet wants his readers to ask these questions, to ponder the mystery, myth, and majesty that is the lone gray wolf.